Not everyone likes change, and indeed, there are not always benefits to be had from it. Change can result in increased efficiency, safety, productivity, and yes, profit. Consider the saga of the construction industry and its paperwork. There's been lots of paperwork involved with construction for probably the last couple of hundred years, and shockingly, change was very slow to come to it. Project foremen and superintendents took notes, even if it was in a informal and primitive way, of daily project events. These notes were then later transcribed into more formal reports, which could be viewed by company owners, clients, and shareholders. Sometimes, when things unfortunately didn't go as planned, these reports could serve as important documents in a trial. Of course, it was very possible that these field notes could be lost. Or that the formal report scribe was a different reporter from the original one and didn't understand what was written originally. Or the formal daily report form was turned in so late that it missed deadlines. And couldn't be submitted as a court document. Or was lost, damaged, or destroyed when filed and stored. It’s time for the paper construction daily report to become history. Advances in digital construction technology and software over the last couple of decades haven't just produced better cell phones and computer games. They have provided laypeople with the means to carry and easily operate small wireless computers wherever they go. These devices are no longer limited to games and conversations, but allow people the opportunity to work on the go, and to work collaboratively with others in real time. Raken for daily construction reporting is part of this positive change. Its software allows an app to be installed on wireless devices powered by Android and iOS. This means that a site supervisor can complete and transmit a daily construction report from almost any location in an hour or less, on easily read, industry standard formats. This DCR can then quickly be transmitted to main offices or other staff for editing or verification without the need for physical travel. And Raken's software and formats also make it appropriate for use as a general construction log. Additional files and even photographs can be added to Raken documents easily. And with Raken, a daily log doesn't have to be tossed into a box or filing cabinet to face a uncertain filing future. These documents can be stored for up to ten years on Raken's cloud platform, safe, secure, and easily accessed by keywords. 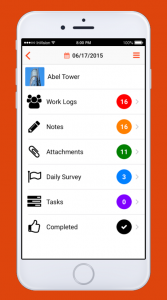 So while the construction agency has been slow to embrace change, technology like Raken’s daily reporting app shows that when it come to daily paperwork, change can be good, and managers interested in efficient, productive projects shouldn’t hesitate to embrace it.